The towns of Addison, Algonquin and Mundelein earned high marks for online government transparency in a recent survey of Illinois municipalities. The current project evaluated 25 towns with populations ranging from Oak Forest’s nearly 28,000 to Calumet City’s 37,000 residents, the 51st– through 75th-largest municipalities in the state. 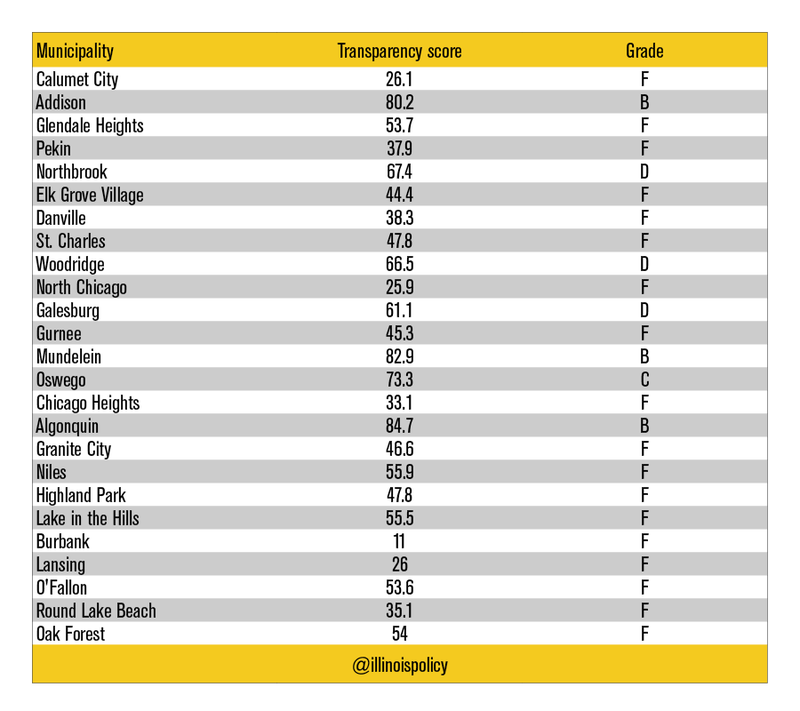 The towns were graded using the Illinois Policy Institute’s 10-Point Transparency Checklist to analyze online transparency standards for local governments. Only Addison, Algonquin and Mundelein earned more than 80 points out of a possible 100 to earn the Illinois Policy Institute’s Sunshine Award for online transparency. A previous audit of the 26th– through 50th-largest municipalities in the state resulted in 13 agencies earning the Institute’s Sunshine Award. Each of those communities are in the top 6 percent in the state for population. With the additions of Addison, Algonquin and Mundelein, 66 local government agencies have now earned the Institute’s Sunshine Award. The city of Burbank recorded the lowest score out of any of the top 75 municipalities in the state. The average score of the 25 agencies was a failing 50.2 percent, though this was still a modest improvement from the 44.2 percent average score registered earlier this year. Click here for a breakdown of each score.